Alan Moore always hates the movies based on his graphic novels, so much so that he refuses to be listed in the credits anymore. I can’t say I blame him. The last time he was credited was on the movie version of League of Extraordinary Gentlemen. That would have been enough to get me to protest Hollywood using my name. Moore was so disgusted by the movie version of V for Vendetta that he refused to accept any money from it. I think he received money from Watchmen, but I’m not certain. All that being said, I must admit that I know I am very much in the minority with what I’m about to say: I loved the movie version of V for Vendetta. I’ve seen it about seven times, and I love it more with each viewing. It’s not necessarily that I love the acting, although I do loves me some Hugo Weaving. I didn’t mind Natalie Portman, but I do think that if it’s a movie taking place in England, you might want to spring for at least one English actor for the leads (although Weaving just gets under the wire by being awesomely Aussie). What I love most about the movie are the ideas and concepts—the big picture of the movie’s meaning. It’s quite a powerful piece, even for Hollywood, if you look beyond the superficial and into the heart of the movie. 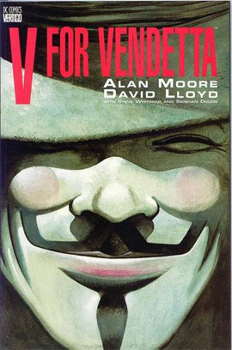 For these reasons, I figured I would give the original graphic novel V for Vendetta a try. I’ve already read one Moore graphic novel this year, so why not give another a go? Okay, sidetrack for a moment. The other Moore graphic novel I’ve read this year was Watchmen. It was toward the beginning of my book challenge, so I didn’t comment on it. Until now. I still haven’t seen the movie version of this novel. I do plan on seeing it, but it’s just not that high on my list of things to watch, man. Heh. Again, I know that Moore wasn’t pleased with the movie. I have to say this, though: If it’s true that the movie improved upon what, for me, was a highly disappointing ending to the graphic novel, then it already earns points in my book. I can’t even begin to express how much of a letdown the novel’s ending was. I’m not going to spoil anything here, because I do think that it’s worth the time and effort to read the novel, but I give you fair warning that you more than likely will end up with a severe case of Whathafu when you reach the big reveal near the end. Now on to V. There’s quite a bit in the graphic novel that was trimmed away for the movie version. Not that big of a surprise, since no one movie is ever going to properly capture everything that’s going on in a novel. I think the only book-to-movie translation that I’ve ever seen that was almost perfectly true to its source material was Stand by Me. And, really, “The Body” was only a novella to begin with, so there you go. There was a lot in the novel that was left out of the movie. In fact, in major ways, the novel and the movie are almost nothing alike. The ideas are there. The overarching messages about betrayal, trust, security, nationalism, experimentation, judgment…they’re all there in both pieces. The novel just plumbs them much deeper. And, to be honest, there was a lot of extraneous stuff that I think deserved to be trimmed away for the movie. I didn’t get a warm, fuzzy feeling for reading this graphic novel, and I don’t mean that in the literal sense. I mean, I usually enjoy the book far more than the movie. Hollywood sometimes gets it okay, but they rarely get it completely right. Plus, there’s always more flavor in the book that makes the story that much more savory and delicious (can you tell I’m a bit hungry right now?). In this case, however, I’m going to have to say I think I prefer the movie to the original source material. I’m glad I read the novel. I’m glad I got all the pieces that didn’t make it into the movie. In some ways, it made for a more compelling story. However, I think for the time when the movie hit the theaters…especially in light of all that was going on in this country under the Bush administration regarding the PATRIOT ACT, wiretapping, surveillance, rabid jingo dingoes, condemnation of the “others,” et. al., the movie resonated far more clearly and loudly with me than the book did. Final score: 3/5. Half a point higher than Watchmen simply for having a better ending. And no sea creatures. I do believe that Moore puts forth some incredibly complex and provocative ideas, and I’m still very much interested in reading more of his work. I think I’ll seek out The Killing Joke next.